Moon snails are pretty awesome. I accidentally stumbled on one when I was a kid and I thought it was some kind of monster coming out of the sand. The snail was at least three times the size of any snail I had ever seen, and the memory has stuck with me ever since. Moon snails are carnivorous snails that feed on bivalves by boring holes in the shells of their prey. So if you see a shell with a perfectly drilled hole in it, there’s a good chance it was a moon snail victim. 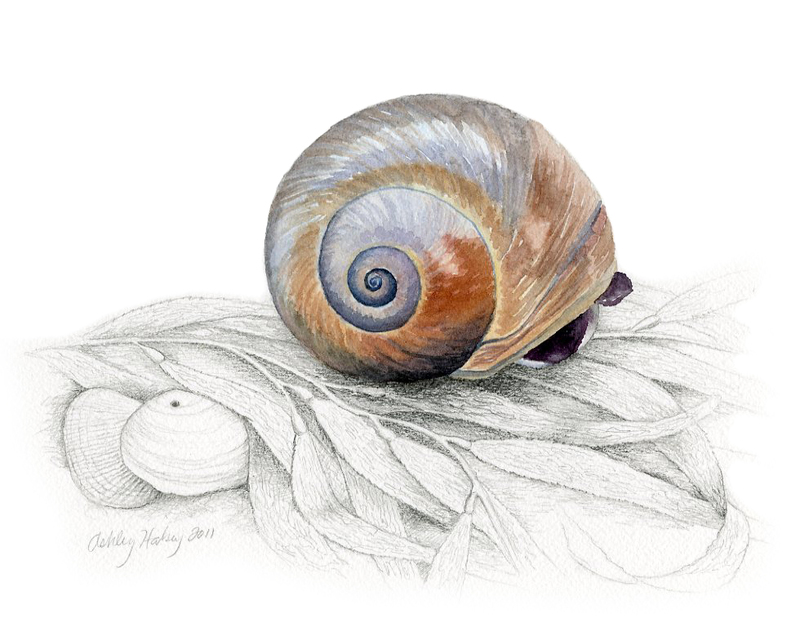 I’ve depicted the snail pulled into its shell here, because I wanted to highlight the colors in the shell. When the snail comes out the foot (the part of the snail outside the shell) is so large that it covers a large part of their shell. It helps them move through the sand in search of prey. Moon snails lay their eggs in a curved ribbon, or egg collar, made of sand and mucus. The structure is smooth, curved and very durable – a rather unusual structure to put eggs in, I think. See the snail in action here. The original work is available for purchase on Etsy.